"Is Iran building a nuclear weapon? Little is known for certain. However, on June 6, 2008, Israeli Transport Minister, Shaul Mofaz said; "If Iran continues with its program for developing nuclear weapons, we will attack it". 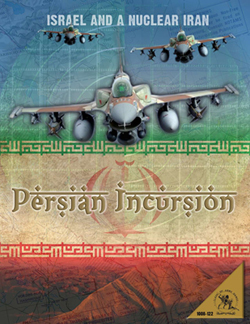 Persian Incursion explores the political and military effects of an Israeli military campaign against Iran. It uses rules adapted from Harpoon 4 to resolve the military action. But its goal is to look beyond the military action by modeling the political and intelligence actions and consequences of a potential political conflict by including a card-based diplomatic/political component to the game. Players spend Political, Intelligence and Military Points to influence allies or enemies, purchase reinforcements, execute military strikes or shape their own domestic opinion. Players choose variable starting conditions that shape scenarios, while random strategic events influence play in unexpected ways. Download the PI Brief as seen at Historicon 2010 here.